A penguin is a type of black and white bird that is the member of the order Sphenisciformes, of the family Spheniscidae which is a group of aquatic, flightless birds found in severe cold climatic conditions such as Antarctica. There are more the 20 different known species of penguins. They have wings which are not meant to fly but for swimming. They manage to tolerate the severe cold weather because of the presence of excessive fats in their bodies. The most characteristic features of penguins involve their walking style and wings which make them a good swimmer. Penguins largely rely on fish and krill for their diet. King penguins are widely found in the Sub Antarctic islands situated at the northern part of the Antarctic. These penguins are assumed to be the second largest penguins among other penguins. King penguins grow up the height of 90 cm and weighing around 14 to 16 kg. These penguins are characterized by their bluish outer coat. These are white on their bellies and they are black on head and neck area. The male adults are larger than the females. King penguins are excellent swimmers with an average speed of 6.5 km per hour. These penguins are smaller than the king penguins and can grow to the height of 55 cm with a weight of about 3.35 kg. 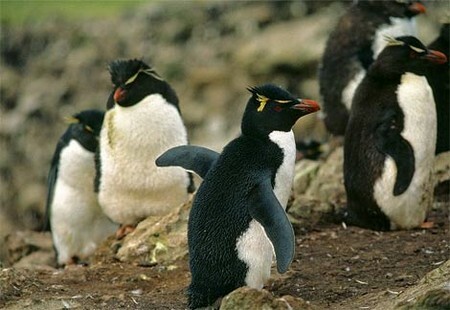 Unlike king penguins, these penguins are more frequent on the islands of Antarctic. Some of the prominent features of rockhopper penguins include their red beaks, salient red eyes and shining yellow eyebrows. These penguins got their name from being popular for jumping and hopping. The diet of these penguins includes tiny fish, krill or squids. The habitat of these penguins is made up of small pebbles and twigs on the rocky hills. Emperor penguins are a step ahead of king penguins as these are the tallest and heaviest penguins among all the other species. 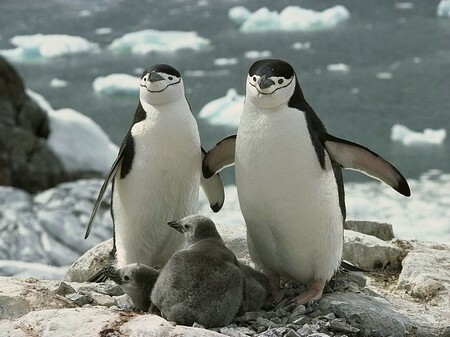 These penguins grow up to the height of 100 cm with a weight about 35 kg. 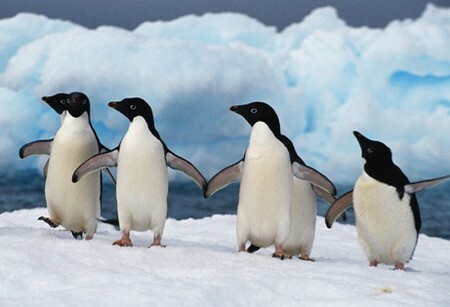 These penguins have an excellent tolerance against the severe cold conditions. Also, emperor penguins are excellent swimmers and can swim with a speed of 9 km per hour. These penguins are black on heads and backs, white on belly and pale yellow on their necks. An important feature of these penguins is their mating ability. They travel miles of distances to look for a partner for mating. Fair penguins or little penguins are assumed to be the smallest penguins among all the others and that is why given the name little penguin as well. These penguins can be seen commonly on the coastal region of New Zealand and Australia. These are one of those species which thrive well in the moderate environment. These are bluish in color on their outer coats. These penguins make their nest beneath the plants with thick braches or in the rock holes. These penguins are spread all over the Antarctic coast along with adjacent islands. There are medium sized penguins that can grow to the height of 30 to 50 cm with a weight of about 4.5 kg. These penguins are known for their long feathers and a red bill often covered with feathers. The characteristic feature of these penguins includes a white ring round each eye. In addition to this, these penguins feed on snow as well along with small fish and krill. The nest of these penguins is a pile of stones arranged in a particular pattern. A surprising fact about these penguins is that the male adults supervise over the eggs laid by females. These are also excellent swimmers. These penguins are frequent along the northern coast of the Antarctic. These penguins grow to the height of 32 inch with a weight of about 10 to 19 pounds. These penguins have orange feet, a stiff tail and a red-colored beak. These penguins also have a patch of white feathers on their heads. 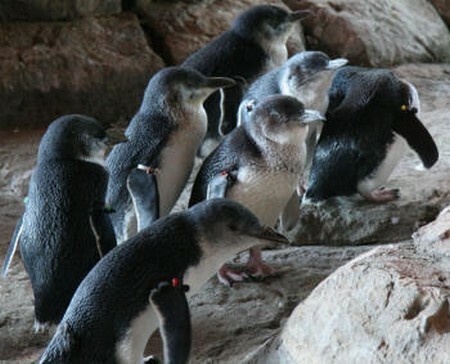 An important feature of these penguins is that they live in colonies and lived on small fish and krill. These are also considered as excellent swimmers. These are called chinstrap penguins because of having a black line on its chin. Chinstrap penguins usually grow to the height of 28 inches with a weight around 9 to 14 pounds. The major part of their diet consists of krill and small fish. These penguins bear orange feet, black eyes and a black beak. These are frequent in Antarctica, especially on the icebergs. These are known as aggressive penguins as they fight with other penguins if intimidated. The nests of chinstrap penguins are made up of pebbles and stones. The female penguin lays one to eggs; however, these are known to raise one chick at most of the time. When the chicks become one month old, parents go out for hunting and visit their chicks every so often to feed them. These are some of the most popular types of penguins and there are many other s having certain distinct features. Some of the other types of penguins are Galapagos penguins, Royal penguins, Fiordland penguins, African penguins, Macaroni penguins etc.